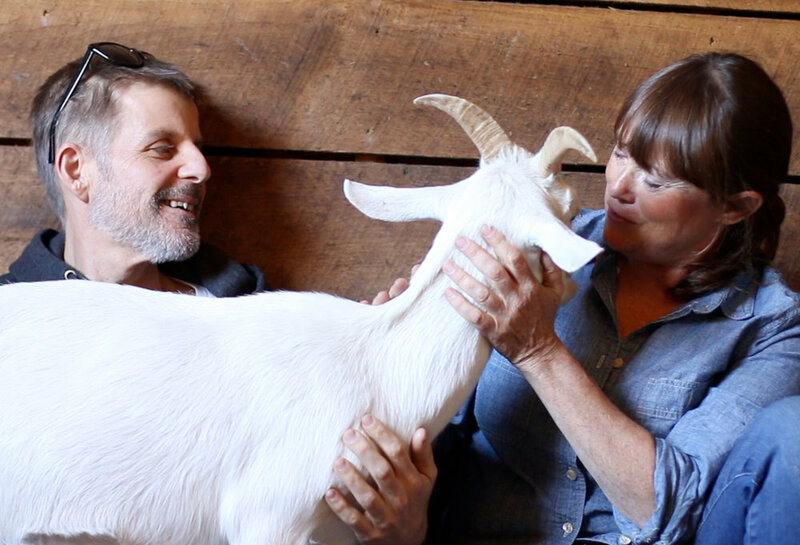 In 2013, we decided that we wanted to share our forty-acre farm with rescued farmed animals. We thought chickens would be a good start and began the process of looking for some hens who needed rescuing. What we learned is that roosters are the hardest birds to place, needing more homes than any other animals. So, we adopted two roosters, Yuri and Jupiter. We never imagined the impact these two fellows would have on our lives. We quickly became extremely attached to these handsome boys. They would greet us when we got home, show up at our back door waiting for snacks, and would eat breakfast in the kitchen with our two dog companions. Their role in our lives ignited a dream to create a refuge for more of these intelligent and affectionate beings. In 2014, we founded Tamerlaine Farm Animal Sanctuary to create a paradise for neglected and abused farmed animals. We currently have quite the flock, including animals rescued from factory farms, ritual sacrifices, urban slaughterhouses, and found abandoned, wandering the streets of New York City. We have clucking hens, crowing roosters, quacking ducks, oinking pigs, turkeys, goats, cows and almost 200 animals that call Tamerlaine Farm their home, all of them with their own unique personality and personal history. In 2017 we purchased a 336-acre property right around the corner from out current farm. You can read all about it here. We are open to the public for visits and events so that people can connect with and learn to appreciate farmed animals as individuals. We frequently have volunteer days in which you can come up for the day and meet the animals, enjoy the beautiful property, and be treated to delicious plant-based food. If you are interested in volunteering, please email education@tamerlainefarm.org or check our calendar for upcoming opportunities. If you are interested in visiting, go to our "Visit" page and make an appointment. We are located in Montague, New Jersey, about an hour and a half northwest of New York City. We also sell a line of food products starting with our popular Hot Sauces! We sell these products at small markets in the tri-state area to benefit the sanctuary, with proceeds going towards our animal rescue operations. Check out our calendar for upcoming markets or come try our delicious products yourself at our local Farmers Market in Milford, PA! You can also order our products online via our "Market" page! If you can help, join our efforts by going to our “Donate” page and give what you can! It is many hands coming together that create change. Help us change forever the lives of animals. Please contact us with any inquiries or comments. We would love to hear from you!